Pioneer, a venerable name in home audio, has come up with a pair of interesting devices to better integrate the audio part of the internet and your own digital music library into your home audio system, the N-30 and N-50 Networked Audio Players. The Networked Audio Players are part of Pioneer’s Elite product line, noted for their excellent construction and superb audio quality. Pioneer foolishly loaned me an N-30 to evaluate. I say foolishly only because I seem to attract products for review that have fundamental flaws that cause me to write far too many negative reviews. Sadly, this is one of them. First, a little about the Pioneer N-30. It’s Airplay compatible, as well as DLNA compliant (more about these features in a bit), and has a huge database of Internet Radio stations at your fingertips. There’s a small 2.5 inch color LCD used to display status. The LCD also displays album cover art when playing MP3 files (if album art is embedded in the file). You can connect many popular iOS devices to the front panel USB connector, and use its high-quality digital-to-analog converter, rather than the cost-reduced-to-a chipset found in most small electronic devices. It’s capable of playing back up to 192kHz / 24-bit LPCM digital audio. 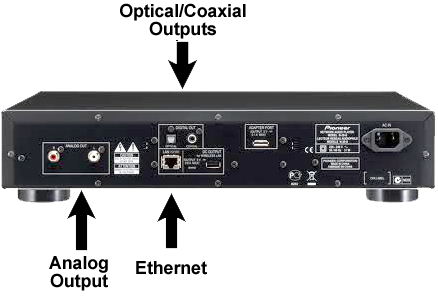 You can connect the N-30 to your audio receiver digitally through either an optical (TOSLINK) or coax cable, or through a pair of RCA jacks for analog stereo playback. I used the optical cable option, as my Onkyo audio receiver is so-equipped. The N-30’s sister model, the N-50 includes additional digital-to-analog converters, as well as a vastly superior power supply for improved audio performance. It also costs $200 more than the N-30. My test unit came loaded to the gills with optional accessories. The Wi-Fi adapter works with WPS-compatible wireless routers, and I can attest to the fact that it worked just fine. I can also attest that I immediately disabled the WPS function in my router once I was satisfied that it connected to my network, as having the WPS function active in your wireless router makes it easy for hackers to bypass the WPA2 encryption (you are using WPA2 encryption with a big password, right?). Fortunately, even after I disabled the WPS function in my Wi-Fi router, the Wi-Fi adapter retained its network configuration. I then repeated the process of configuring the Wi-Fi adapter from my desktop Mac, which was decidedly less pleasant, though in the end, it worked just as well. The Pioneer Elite N-30 also came with a Bluetooth adapter, making it possible to play music wirelessly from your iOS or other compatible Bluetooth-equipped devices to the N-30. A free iOS or Android app can be downloaded to remotely control the player. As a technical writer, I can tell you that Pioneer’s documentation is extensive, and well-written. Kudos for still providing a complete documentation set—something that is more and more a rarity. Setup, including the WPS method of configuring the Wi-Fi adapter, took about 30 minutes. Expect another 15-30 minutes to configure the Wi-Fi adapter manually. Connecting directly to a wired home network makes it available almost instantly. I was disappointed when the N-30 didn’t see my DLNA-compatible Synology Networked Attached Storage device, though it did see my DirecTV DVR. After fiddling with the settings on my NAS, I finally got the N-30 to recognize it. I was then able to move through the directory structure and play music. This is where I found the N-30’s fatal flaw. The front panel LCD is about 2.5 inches diagonal. From a distance of 10-12 feet (3 to 4 meters), the display is unreadable. The fact that it can display album cover artwork from MP3 files is a pretty pointless feature unless you choose to control the device from the front panel, or from its remote control, while standing directly in front of it. This flaw is even more apparent when attempting to search through its database of some 15,000 Internet radio stations. Across the room in the comfy chair? Forget it. Any interaction with this device other than very basic settings (shuffle, default Internet radio stations, etc. ), is going to require that you be up close and personal. If you have an iOS device (iPhone, iPod Touch, iPad), you can download Pioneer’s free app that transforms your iOS device into a potentially useful remote control device (there is also a similar app for Android devices). I downloaded the app and installed it on my iPhone 4. After doing a search of my Wi-Fi network (I had to repeat it several times), my iPhone finally found the N-30. I was able to navigate to the music folder on my NAS, and was then able to view the music files in many different ways (song title, artist, album title, etc.). I found several interesting Internet radio stations (including a jazz guitar station!) and was able to set up favorites for even easier locating later. Until Pioneer comes out with a new model that includes video output of some sort, Pioneer’s iOS app is the only way you will be able to use the N-30 from your comfy chair without wanting to throw said (expensive) N-30 through your nearest window. In my opinion, the N-30 (and N-50) screams for an HDMI port (or some kind of video output). This way, you would be able to see the directories, Internet radio stations, iPod control, etc. from said comfy chair across the room. Maybe Pioneer will deal with this major deficiency in their next generation Networked Audio Players. I had other problems, too. Maybe it’s because I have an excessively large music collection stored on my NAS (some 23,000 songs, ripped from my extensive CD library, iTunes Store purchases, and many eMusic.com purchases, but moving through my collection was a very slow (some might say glacial) process. In fact, the remote control app lost its connection with the N-30 on numerous occasions while trying to find and play music stored on my DLNA-compatible NAS, requiring me to reboot pretty much everything to satisfy the network Gods. Furthermore, when all else failed, I had to remove and reinstall the app. I did this about six times this evening while trying to test various functions of the iOS app. It was often the only way I could reconnect the remote control app to the N-30. Admittedly, it did work a little better when I abandoned the Wi-Fi adapter and connected the N-30 directly to my Ethernet home network. Even when the iOS remote control app was working well, it was still a very tedious process to scroll through a list of almost 900 artists (as it is in my music collection), as only four or five items are displayed at a time. You need to scroll and wait for the list to update, then scroll some more. If you’ve got a large collection, and you’re looking for your collected works of Zoot Sims, be prepared to scroll. A lot. And to make things even worse, nothing is stored, so if you decide to scroll back to, say, George Van Eps, you’ve got a lot of scrolling to do, and you need to wait until the screen updates to see where you are before you resume scrolling through the list. The iPod player function of the iOS app was a one trick pony. When the iPod menu item was selected (using a 160 GB iPod Classic), I could only start playback, and then couldn’t even pause or stop it! It did work fine with the regular Pioneer remote control, though. It takes almost a minute to power up—almost as bad as my Blu-Ray player. In terms of sheer performance, audio quality was superb, and of course, that’s why you might consider buying a device like this. It is part of Pioneer’s Elite line, after all. Obviously, your mileage will vary as your sampling rate varies. Music recorded at lower sampling rates will not sound as realistic (or as good) as music recorded at higher sampling rates. Most of my music is encoded at 256 kilobits per second, and at that sampling rate, it was, to my damaged ears (thanks to several years as a regular passenger in the back of Air Force cargo planes, overly-loud headphones on my various portable audio devices, and blasting away with my car stereos), quite good. I noted no digital artifacts or other acoustic anomalies. AirPlay worked great. I launched iTunes on my main Mac, went to the “speaker” button at the bottom of the screen, and the N-30 was right there in the menu choices. As soon as I selected it from the list, I heard the stereo downstairs light up and it was playing what I had been playing at my iMac. Neat stuff. With this feature built-in to the N-30, you don’t need an AirPort Express to bring music to other locations in your house. By this time, however, the damage was already done. I didn’t even bother testing the Bluetooth adapter. My frustration level was so high at this point, I decided to break it all down and pack it back up and ship it back to Pioneer. It’s a darned shame, too, as the audio performance was excellent, and the idea of unifying various sources of digital and internet audio into a single device is a great idea. Unfortunately, at least in my humble opinion, without a video output to permit the functions to be visible across the listening room with either the Pioneer remote or the iDevice app controlling things, this device is much too flawed to be a valued member of your home audio/video entertainment center. To add insult to injury, the remote control app was far too buggy, and the iOS app far too easily corrupted, based upon my experience of having to remove and reinstall the app in my iPhone 4 on multiple occasions. Having a large music collection only served to amplify the failings of this product. Frankly, people with large music collections could really use a device like this to help make good use of their collection without having to fire up the computer to locate and play items (especially if they have their music collection stored on a DLNA-compatible NAS). Jeez, it has such unrealized potential. Again, I hope the next-gen Networked Audio Players from Pioneer resolve some of the issues I’ve described in this review. Because of the many flaws I encountered while reviewing the Pioneer Elite N-30 Networked Audio Player, I regret that it’s necessary to give it a fairly negative rating. I think the display is NOT a problem in this device. While it could be bigger, I would use it like: walk in front of the player > select source/folder > forget it. I want a player which can play all day without me having to fiddle with it constantly. I have no display attached to my music set up so HDMI out would not help me at all. There are a lot of “media players” available which CANNOT be used without a distplay/tv set. They are useless to me. I prefer standalone player. There is however another fatal problem with Pioneer. It cannot play direct from HDD. You can plug a USB flash drive to the unit and it works fine, but you cannot plug a 2,5″ USB drive with your entire music collection to this device. It is not supported. I wish there were some solution available. At the moment there seem to be no mp3/flac player available (unless you count some very expensive devices like Naim). Squeezebox Touch was almost ok, but it is discontinued. Maybe next year there will be a reciever which supports USB HDDs and can play music files. U wish.